You will need a pattern of your choice, yarn in colors for your border threads, background threads, pattern threads, a pick up stick, a belt shuttle and a rigid heddle. Patterns should be drawn on diamond grid. In my demonstration I am using a Schacht Cricket rigid heddle loom and a Stoorstalka Shuttle with #3 Cotton Crochet thread. Start with 2 threads in each slot and hole. In my example for this demonstration, I'm using blue for the border with white as the background color and red as the pattern color. I warped 2 threads of blue in each slot and hole and then 1 white and 1 red in each slot and hole for 16 slots and holes since that's the amount of pattern threads I wanted for my design area. An odd number is better since you can center the design on a single point, but you can make it however you want it. It doesn't matter if the rigid heddle is in the up or down position but for this tutorial we will start with the UP SHED. Stick your hand into the shed and using a pick-up stick, pick one each of the border threads and only the background colors from each slot and hole. The pattern threads will be ignored in this step. Turn the pick-up stick on edge. Insert the shuttle into this new shed, beat and pass the weft. Turn the stick flat and change the shed. You are now in the DOWN SHED. Turn the stick on edge. Insert shuttle into lowest shed under the cross created by the pick-up stick. Remove the stick, beat and pass the weft. Do the same for the down shed that you did for the up shed. Picking the pattern threads is now just a matter of repeating what you have been doing, except, instead of picking the background threads, the pattern thread is picked instead. In my example, the first pick is 1 each of the 7 white threads, 2 red threads, 7 white threads and 1 each of the border threads. TIP: If you see this, it means your warp threads are twisted. Following the video had some problems, I am using a rigid heddle loom. Why diamond grid for the pattern? my pattern just wouldn't form trying to create chevrons, maybe twisted yarn? also problems finding the bottom shed when the heddle down. Diamond grid is more representative of warp faced weaving. Backstrap weavers use it. Without seeing your set up I'm unable to diagnose. Bottom shed will be narrow. Look for it directly under the cross. I really want to do this but have never done inkle weave before, I am using rigid heddle I don't understand how your threads are so spread out but turn into a much narrower band? My thread and band width were pretty much the same..
You want the band to be WARP FACED. You don't want to see the weft threads much, if at all. 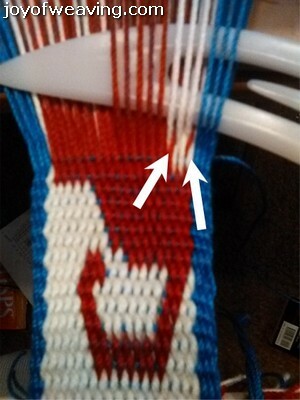 You are probably not pulling the weft thread through tight enough to "scrunch" the warp together.